Now that I’ve shared all of my Israel photos (you can check out Tel Aviv Day 1 here, Tel Aviv Day 2 and 3 here, and Jerusalem here!) I wanted to do one final round-up of my favorite things to do and see in Tel Aviv. 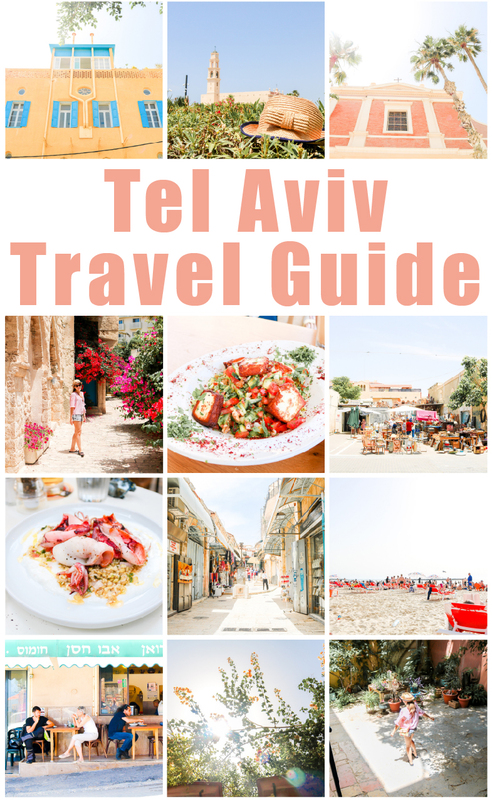 Although we were only in Israel for four days, we were quickly smitten with Tel Aviv, and have hopes to return again very soon :) So this post is a keepsake for me when we make our next trip east, and a guide for you if you’re also thinking of visiting Tel Aviv sometime soon! Some things to know before you go . . . The main airport in Tel Aviv is Ben Gurion International Airport, which is named after the first Prime Minister of Israel. Landing in Israel and getting through customs was a breeze. There is a train that goes from the airport to the city center in 20 minutes, but we elected to take a cab for ease. When you fly out of Tel Aviv, make sure to arrive at the airport at least three hours early. Ben Gurion is one of the most secure airports in the world, and before you get to your gate, you must go through several security checks. Kai and I were prepared for the worst, but wound up getting through security relatively quickly as we were flying late on a Monday night and the airport was quiet. However, we could see rows and rows of ropes set up for when hundreds of travelers all descended upon security at once. Be wary as I am sure these ropes are often put to use! For our accommodation, we decided to stay in an Airbnb, as we would be in Tel Aviv for three nights, and wanted a bit more space to spread out. Also, the architecture and design in Tel Aviv is so unique and beautiful, we were hoping to have the experience of staying in a home. We decided to rent a spot in Yaffo, as it was walkable to the Old City of Jaffa, and quite a few of the other spots we wanted to check out in Tel Aviv. This is the spot we booked, and we would highly recommend it! A note on Saturday travel . . . In the Jewish religion, Shabbat (Saturday) is observed as the holy day. As Israel is a Jewish country, if you plan to travel on a Saturday, your travel will most likely be impacted by the country-wide observance of Shabbat. Most restaurants, stores, public offices, and other business are closed Friday afternoon through Sunday morning. We had been advised that getting a cab or checking into our hotel or Airbnb on Saturday might be tricky. Luckily we still managed to get a cab no problem, although we did pay a small surcharge to our driver due to the Shabbat. 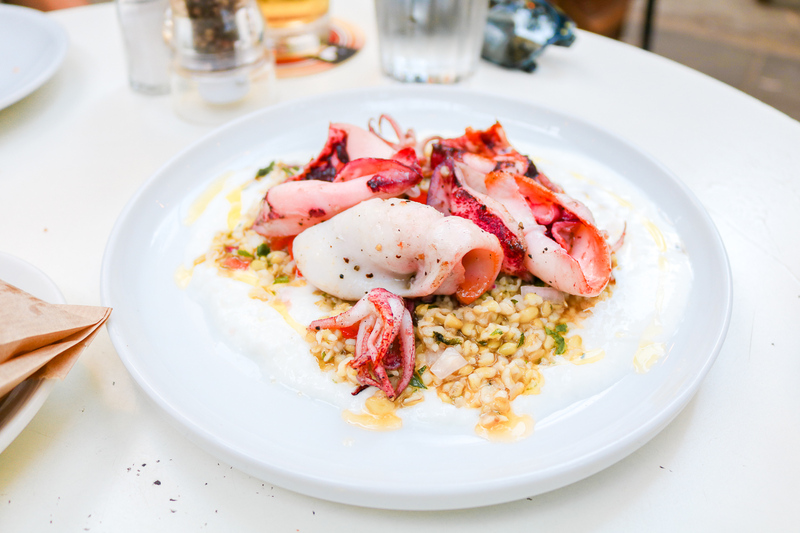 And now, on to the good stuff – here’s my top list of things to see, eat, and do in Tel Aviv! 1) Relax at a beach club. 2) Order a big bowl of hummus. Where did hummus first originate? Some say it’s a Greek dish. Others say its Turkish. Perhaps it even hails from Egypt. No one really knows the birth place of hummus, but having traveled A LOT, and having a real affinity for hummus (the guy at my local hummus shop knows my order when I walk in – I kid you not) I can say first hand that the best hummus hails from Israel. And perhaps the best hummus in Israel is from Abu Hassan. The hummus at Abu Hassen is famous, and it’s not very hard to see why. At this small, unassuming hummus joint, workers, locals, and tourists alike pile in, sitting shoulder to shoulder, mopping up huge gobs of hummus with delightfully soft pita bread. There are only two dishes on the menu at Abu Hassen – hummus or hummus masabacha (hummus with whole chickpeas), both of which are served with warm pita, spicy sauce, and a fork to help you on your journey. I ordered the masabacha and Kai got the regular hummus, and we were both treated to warm, rich bowls of nirvana. The hummus was incredibly well-balanced and flavorful, and so creamy at the same time. I’ve never had a huge bowl of ONLY hummus before – but at Abu Hassen I was literally scraping the bottom of my plate with a fork, eating the hummus as if it were mashed potatoes or a bowl of pasta! Put this one on your Tel Aviv bucket list for sure :) and sample some of the world’s best hummus. 3) Rent bikes and tour the city on two wheels. Neve Tzedek is an enchanting neighborhood with boutiques, stylish restaurants, and even a weekly farmers market. Cycle through Neve Tzedek, and don’t miss Shabazi, the main road that runs through the neighborhood. Tie up your ride, and stumble into any of the shops or restaurants along the road to feast your eyes and reward your taste buds. Kai and I stopped for some delicious frozen yogurt on Shabazi and were not disappointed! Florentin is another dreamy neighborhood, and was our favorite to explore by bike. Here you will find tall trees, walls splayed with colorful art, hip bars, art galleries, and numerous eateries. It was here Kai and I gorged on Italian appetizers, drank cocktails at a taqueria, and cycled up and down side streets until sun down. After Florentin, our favorite cycle route in the city was along the water. Quite a few times, we cycled to from the port in Jaffa all the way up to Hilton Beach. This was a great route to enjoy the sea breeze, and thanks to the many bike racks along the way, we were able tie up, stop for an ice cream in the sun, and then continue our journey onwards! You can learn more about the city’s bike scheme here. If you go to Tel Aviv, you HAVE to go to Bistro 60. Kai and I arrived to Tel Aviv on a Saturday, and to our dismay, many shops and restaurants were closed for the Sabbath. In need of a proper meal and without many options, our Airbnb host kindly suggested we walk around the corner to Bistro 60, where we would be able to enjoy a meal despite the holy day. We ordered a few dishes off of their appetizer menu to share, and were BLOWN AWAY by how amazing the food was!! To be fair, we were wow’d by the quality of the food in Israel time and time again, however our favorite meal was by far this first one at Bistro 60. Some highlights from our meal was the fresh and fragrant halloumi salad (above), the creamy hummus, and the roasted eggplant. We ordered five appetizers to share, and were literally scraping the bottom of each plate with a spoon so we didn’t miss a drop. 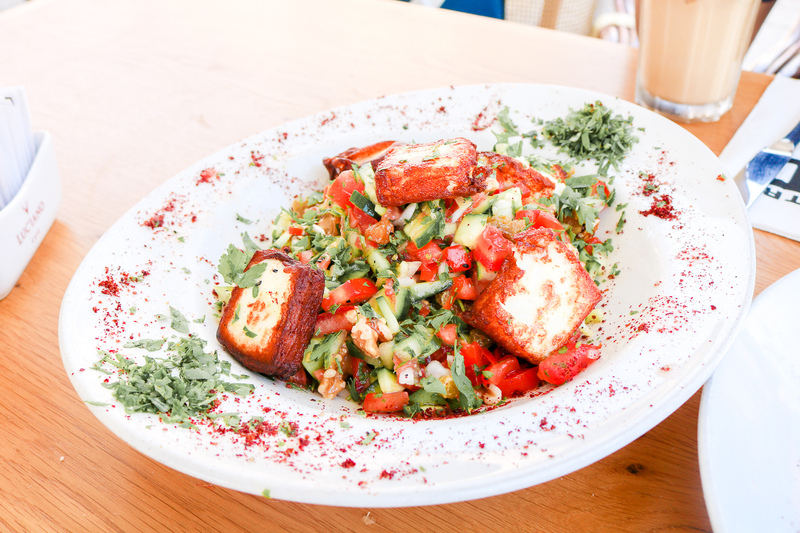 If you want incredibly fresh and scrumptious Israeli fare, go to Bistro 60 – your taste buds will be thankful! 5) Spend an afternoon walking through the Old City of Jaffa. This gorgeous neighborhood would have been top of the must-cycle list, as it was by far my favorite area to explore in Tel Aviv! However, the Old City is laden with cobble stone streets, narrow alleyways, and many steps – not ideal for biking! This is one spot you’re going to want to explore on foot, and with some good footwear! The Old City of Jaffa is nothing short of captivating. 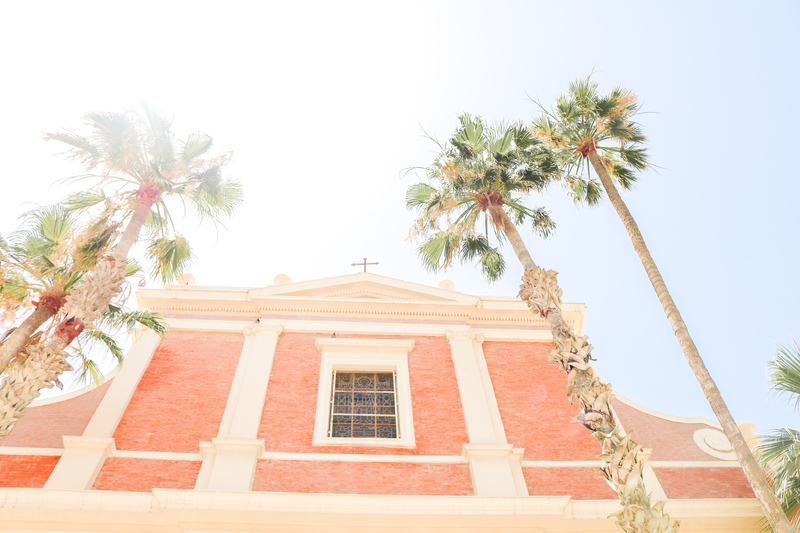 Your stroll will reveal an oasis with a rainbow of florals, ancient clock towers, green parks, mosques, churches, and an array of adorable boutiques and art galleries. Admire the architecture, stop to enjoy a juice in the sun, and soak up all the beauty of this pastel neighborhood. Whether you stop by in the day time or in the evening, a jaunt along the Jaffa Port is not to be missed. Here you will find several cute industrial restaurants, along with bobbing boats and shady outside seats. The atmosphere is incredibly dreamy, with locals and tourists alike all looking to score a spot in the sun. Kai and I had dinner along the water at the Jaffa Port (more on this coming up!) and one afternoon we stoped for a drink and a plate of watermelon in the sun. The harbor serves as a fishing port, so as we enjoyed our drinks, we watched fishermen go about their trade, sailing in and out of the harbor. Snag a spot and enjoy the sea breeze, while sipping a refreshing Aperol Spritz. The Jaffa Flea Market is a slight to behold, with vintage furniture, colorful textiles, and lots and lots of junk. Wander through the market, stop for a coffee at one of the many adorable cafes, and continue your shopping. There were inexpensive souvenirs and goods, as well as upscale boutiques with fine scarves, paper products, and ceramics. While I didn’t buy anything at the flea market, we loved walking along the various shops and stalls, taking in the colors and the art. Set against the neighborhood’s sand-colored houses, these vibrant second-hand wares were a sight to behold. Abulafia’s Bakery is an institution in Tel Aviv. After strolling through the flea market, Kai and I noticed a large crowd at the end of Yefet Street, and made our way over. Here we found a mass of baked Arabic goods, from fluffy balls of bread to dazzling sweets, dripping with honey, topped with crushed pistachios. While Abulafia’s was delicious, it was also crowded. It was quite the experience to order at Abulafia’s high counter amongst a sea of people (in another language!) While we felt that Abulafia’s was slightly over-rated, this first Arabic bakery stop inspired us to duck into a few others on our trip, where we were rewarded time and time again with delicious pastries!! So start your day at your neighborhood’s local Arabic bakery, or save some space in your stomach for a mid-morning snack where you can sample some of Israel’s most tasty treats! 10) Fall down Tel Aviv’s culinary rabbit hole. Port Sa’id – We heard this was a great spot for food, drinks and music. Caramel Market – We wandered through the Caramel Market on our last day, and feasted our eyes on many different Israeli treats. While a bit crowded, this is a great spot for picking up some Israeli street food. Hakosem – The go to place for falafel in Tel Aviv. Manta Ray – An ocean side restaurant with amazing sea food. We cycled by here every day, and were bummed we didn’t get a chance to enjoy a meal at Manta Ray – next time! Benedict – We heard Benedict was great for breakfast, and at one point we walked by . . . but we always wound up filling up on Arabic pastries in the morning and never made it for a propert sit down breakfast! Next time we would love to try their shakshuka. Aladdin– A cozy Mediterranean restaurant in Jaffa with great views. 11) Take a day trip to Jerusalem. Taking a tour through the Old City. Here you will find Temple Mount, King David’s Tomb, and the Last Supper room – not to mention a labyrinth of streets and alleyways that Jesus and his disciples once walked. Divided into four quarters – Muslim, Christian, Armenian and Jewish – the Old City is a fascinating place to explore, with a religious significance that spans far beyond Christianity. We also loved exploring the Mahane Yehuda Market. I suggest visiting in the day to explore the different shops and stalls, and then come back again in the evening when you can get a drink or a late night falafel. Lastly, the best dinner of our time in Israel was at Yudale. Stop by my Jerusalem post for the full story of our meal, but in short, there was singing, dancing, open flames, shots with the bar staff, and lots of delicious shared plates for our meal! The atmosphere, great staff, and food make it a must if you’re in Jerusalem. If you’re thinking of visiting Israel and have any questions, let me know in the comments and I am happy to help you plan! Otherwise, can’t wait to share my next update on Italy with you!